whose much-loved beret was once described by an obscure and disliked “funny” uncle figure as looking like a “cow pat”. Now, I’m not sure if those words translate to non-Australian speakers, but reast assured, it’s not a good or flattering thing. My point being, I know a thing or two (and not much more) about beret descriptions. And this one looks like pie. See? Pie. No? At least, pie in progress. Aaaaaaaahhhhh! Aaaaaaahhhhhhh! 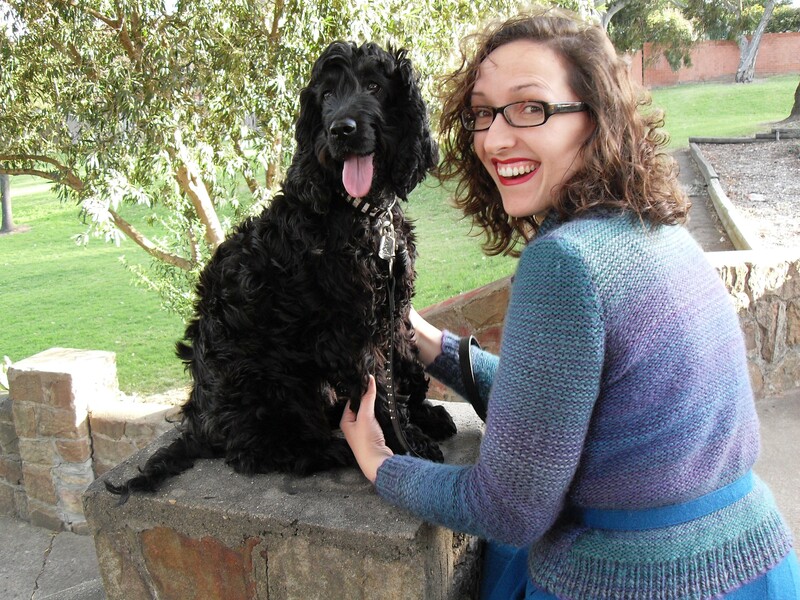 I’ve set up my first pattern for sale in the Ravelry store, it’s called the Rolling Moss Jumper aka RMJ. 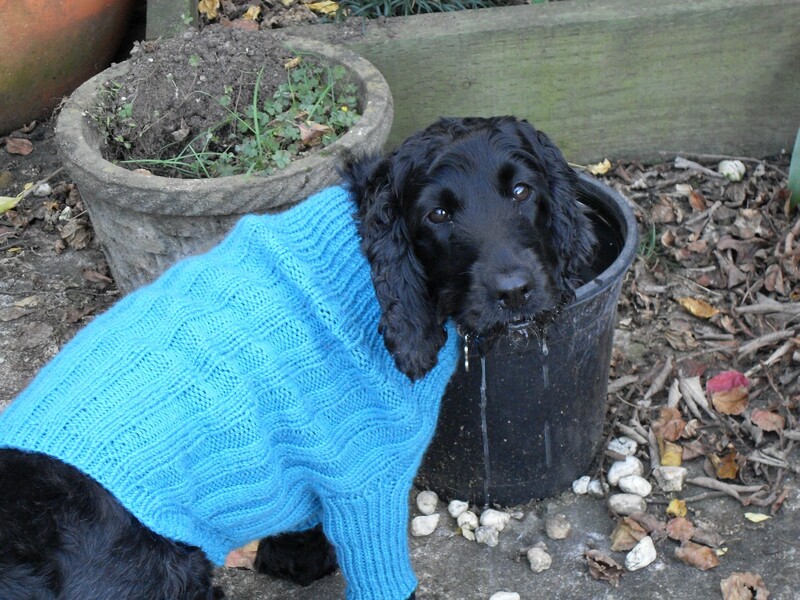 Obviously, as a keen knitter and knitting enthusiast, you are already a Ravelry member. If you are not, you are wasting your life. Ravelry. Be at Ravelry. No, I’m not joking. Now. Go there now. Ok? Done? Member? Good. 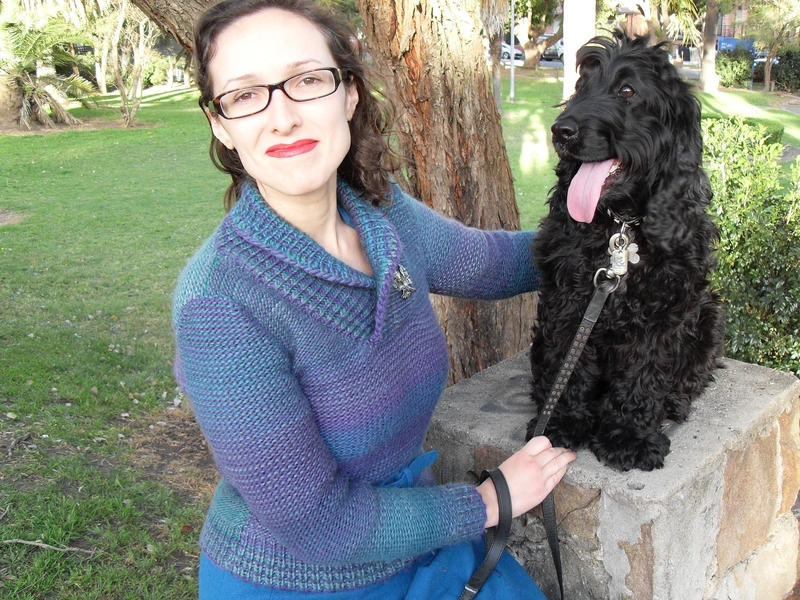 To rejoin, Ravelry is awesome and now I have a pattern there. If you like it, consider buying it. It will help to fund my handmade earring addiction on Etsy and that can only be a good thing. Also, I think this is a pretty pattern, I’m quite chuffed with it, so I hope it may bring you joy also. Here are a few pictures. Now, I still haven’t written up this pattern (bad Chrissy, very bad), and I will will will do that soon, however I can’t resist sharing more pictures of Poppy looking sour about the whole situation. Nothing beats a good nuzzle. 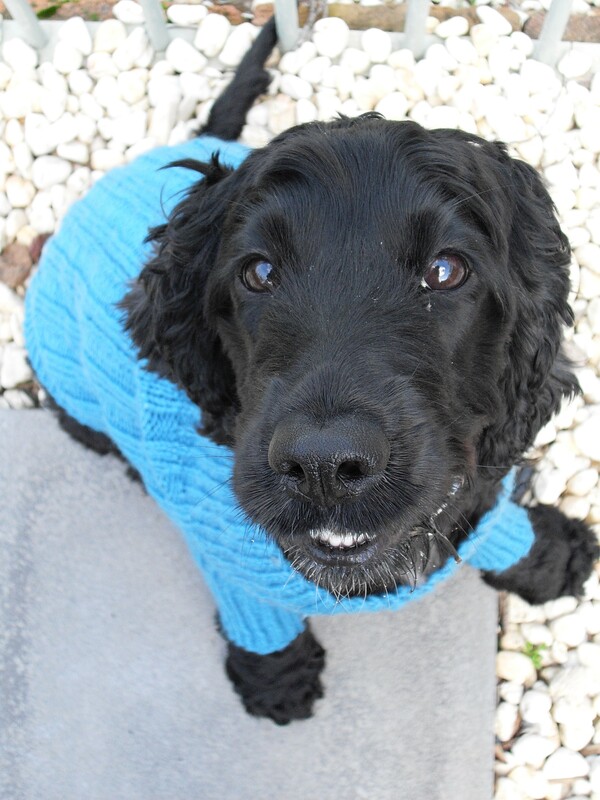 Perhaps this stoopid jumper will some how “accidentally” come off…..
It’s just the start of winter here in Australia and my little child-substitute Poppy if feeling the cold (so far as I can tell). And since dogs are people too, I’ve been keeping busy giving my baby wardrobe choices (not that she actually has the ability to indicate a preference, but you know, she has a right to variety in principle). So I’ve written up a little some thing in Poppy’s size, which is medium canine, 45cm chest circumference. In the next few days I’ll write up the pattern in a full range of sizes and load it up to Ravelry for your own knitting delight. In the meantime, here’s a taste. It has come to my attention that the link I had previous posted for the Trauma Teddy knitting pattern is now broken. I’ve been unable to track down another one on the internet so far, so I’ll just type it up here so that anyone who wants to help the Red Cross provide these teddies to sick kids can get stuck in knitting. Once you’re done, be sure to contact you local branch if the Red Cross the get the flame-retardant stuffing a Red Cross labels. Remember the Red Cross is very strict about the Trauma Teddies adhering to their set pattern, so follow the directions carefully. Use 8ply wool or acrylic only to avoid allergies. Use sixe 9 (3.75) or 10 (3.25) needles. LEGS AND PANTS: Cast on 10 stitches (leg). Knit 34 rows. Change colour for pants. Knit 8 rows. Knit anothr leg to match. Knit across legs another 14 rows. 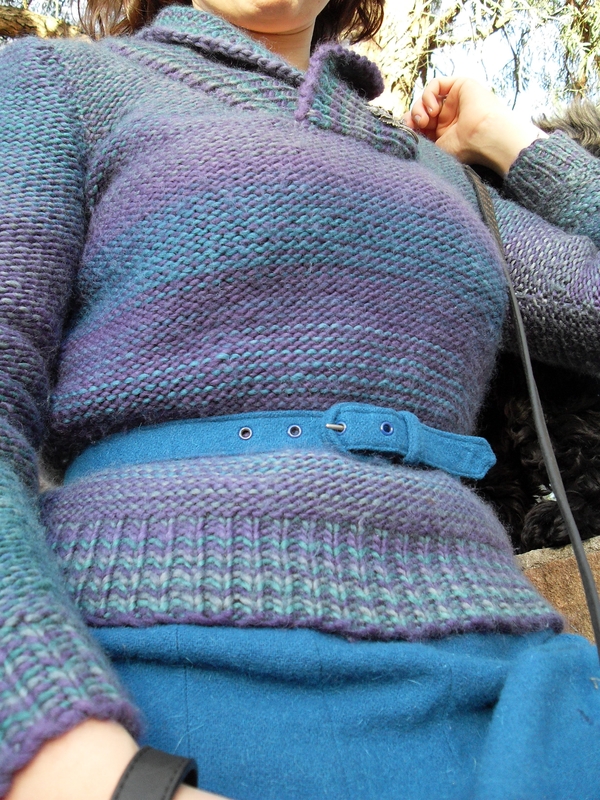 SHIRT (CHANGE COLOUR): Knit 18 rows. Sleeves: Cast on 12 stitches at beginning of next two rows. Knit 18 rows. Cast off 12 stitches at the beginning of the next two rows. Leave wool when casting off to sew up completed bear. HEAD (CHANGE COLOUR): Knit 34 rows. Cast off. Knit other side to match. Sew on a happy face. Sew front to back edge to edge, leaving an opening for filling. Sew across corners of head to form ears. Fill with soft filling (supplied by Red Cross) and complete sewing up. Gather around base of head to form neck. Sew Red Cross label on chest or tummy. The world knows now that Australians have endured the worst natural disaster in our history in the last five days through the bushfires in rural Victoria. Shame on me, I’ve been quite quiet on the actual “words” component of blogging, opting more for those process tasks of loading vintage patterns and tagging them on Ravelry. Anyway, yes, I’ve been a little Ravelry obsessive, and who could blame me? So much organisation. Such efficient process… there’s something in that appeals to the nature of the natural knitter. A desire for process and order. Riiiiight, enough knitting philosophy for me (what a sad sack I can be). ANYWAY, back on it, I haven’t been writing much because I’ve been compulsively Ravelrying, but also working on my next pattern to humbly submit to the infinite wisdom of Amy (this would sound like a massive crawl but I know as sure as the day is long that Amy has higher priorities than rading my blog…. not that that means you should stop, no siree). ANYWAY, yes, it’s 10pm and that’s a little late for me to be awake, so I apologise for the Sunday night haze. Warm weather in Sydney, we’ve got to french doors open to the balcony to let the suggestion of a breeze edge hesitantly in. Half watching the cricket live from Perth, where it’s still pretty light, which is so strange. It is the same contient after all. It’s just I don’t really get over to Perth much… in a never been kind of way. Cameron tells me Perth is closer to Singapore than Sydney. How about that. OK, so forgetting concentrating, what I’m trying to say is I’ve been working on a new pattern, trying to contribute something to our knitting community. It’s a nice community, it deserves lovely things. I’m trying to make one. I’ve been buying vintage dresses on ebay, and last week I bought the sweetest dress to go with the sweater I’m making. The dress is very geometric, with little arrows in purple, blue and white. 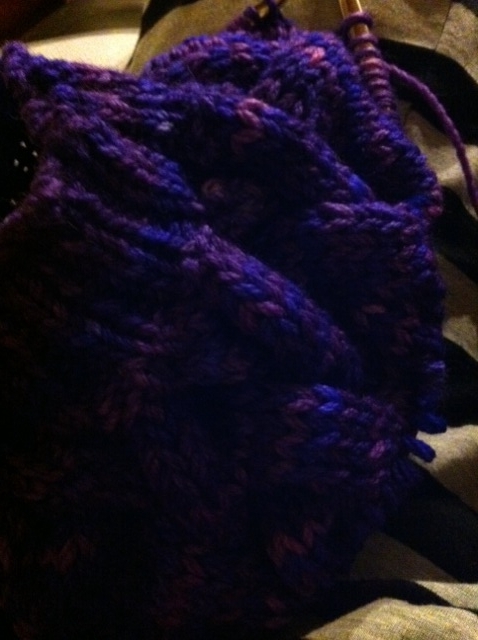 The yarn I’m using for the sweater is a light purple too, slightly contrasting from the dress. 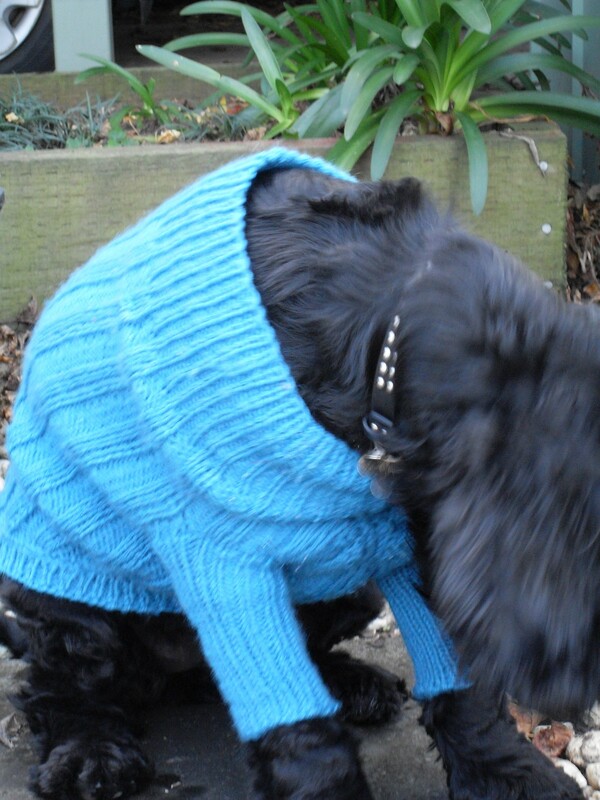 So I’ll be submitting this pattern for consideration in the Summer 09 Knitty. It’s a cotton and silk blend, so it’ll work nicely in summer, just light like fairly floss but less sticky. It’s made in the round so it’s try-as-you-go (love that). I’ve made the sleeves and I’m three quarters through the body, so I should be finishing up the writing of the pattern soon, which will get it into Amy’s in tray in time before the March deadline. If you’ve ever thought of sending Amy something of your own but haven’t done it, please give it a go. I’m totally clueless and self taught, but they let me in once. I’m brave enough to try again (and I did have two well deserved rejections first up). Be bold. I’ll say good evening to you.